Is Venice romantic? Even if you go there alone? Or is it only for lovers? 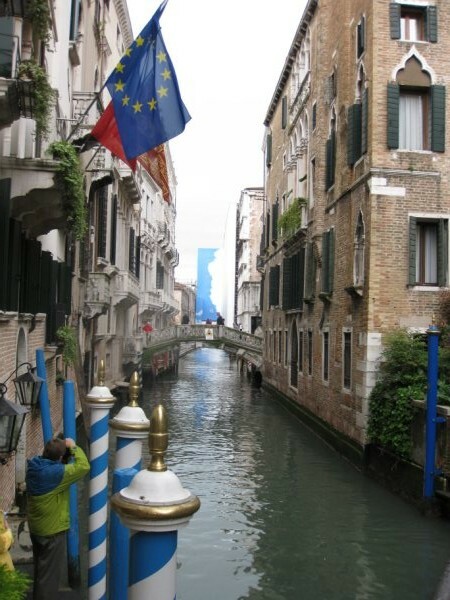 This is the tale of my first trip to Venice, when I was single and not sure how Venice and its starry-eyed rep for romance was going to measure up without a significant other. Crossing the Bridge of Sighs seems appropriate. 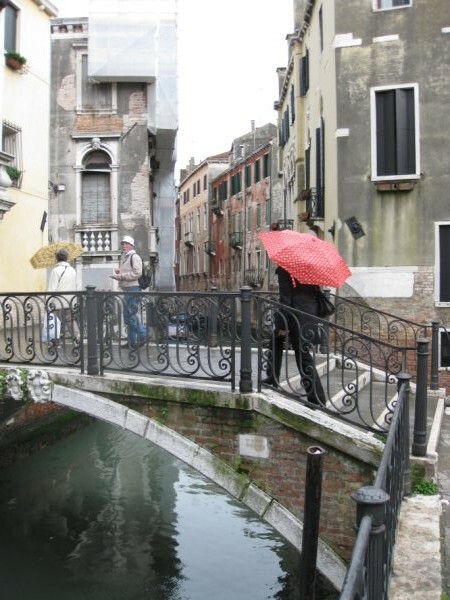 Growing up, I’d always dreamed of honeymooning in Venice. I’ve finally made it here, but instead of sharing it with a partner it’s just me, a red-headed guide named Franca and a handful of fellow tourists. Who knew I’d grow up to be a commitmentphobe? Through a window in the arched limestone bridge I look out over a narrow canal. A steady rain has stained the water a moody gray green. This covered walkway that connects the Doge’s Palace to the former prison was the last breath of freedom for many, yet it has a romantic legend – it’s said that couples who kiss on a gondola at sunset under it are guaranteed eternal love. There’s no word on what happens to solo travellers crossing over it, but when one of the most notorious singles of all time, Giacomo Casanova, tramped this trail, he was heading for a cell in the dreaded Piombi Prison. It was 1755, a time when Venice’s might as a seafaring power had waned and indulgence was king. Vivaldi’s music rang through masked balls, the madness of Carnevale was at its height and behind the grand facades a culture of personal gigolos (cavaliere serventes) and courtesans thrived. Even for decadent times Casanova’s behavior was too much and he was imprisoned for crimes against religion. There’s no tying a wanderer down, however, and he escaped by cutting a hole through the ceiling and running off to Paris. Walking along a row of cells, I trace my fingers over faded carved graffiti then follow Franca back over the bridge and into the Doge’s Palace’s gilded Council Hall, where the largest oil painting on canvas in the world, Tintoretto’s Paradise, covers the wall behind the doge’s throne. “The women, too?” someone asks. “Of course not,” Franca says. “Patrician women were second-class citizens. Their main job was to bear a male heir.” Having a son was essential, she adds. Families kept their place in nobility through the male line. At least that’s one pressure an unmarried woman didn’t have. And there were plenty of females with no prospects. Dowries were costly and according to Patrick, a history buff and the only male in our group, there simply weren’t enough eligible men. While a nobleman could marry a woman of the merchant class and retain his status, noblewomen didn’t have the same option. With limited choices many took the veil. “That’s the convent for me,” says the woman beside me as we leave the palace and step into massive St Mark’s Square, which Napoleon, upon his 1797 invasion, called ‘the finest drawing room in Europe.’ Behind us is the domed St Mark’s Basilica and on my right, the historic Caffè Florian where Casanova once dallied. After the tour, I venture with a few of the women over to the sumptuous Danieli Hotel. Overlooking the lagoon, the core of the hotel is a restored 14th century palazzo. Under a fat Murano glass chandelier, we order wine from a snooty waiter, who makes it clear we’re not a priority. Maybe he considers us second class citizens, only good for bearing male heirs. Well, things weren’t always so easy for men in the marriage department either. In fact, Venetian society had a curious inclination for avoiding matrimony altogether. Often only one son from an aristocratic family would marry – this kept the family wealth concentrated – and whispers of wife sharing circulated. Some historians say that this culture of celibacy (or at least of not getting married) contributed to the decline of the nobility. Sure, blame the single people. The rain has stopped so I take a vaporetto, or public water bus, down the Grand Canal. The water is a frothy turquoise, waves lap against algae-coated piers and the sun glints off palazzos like shards of a broken chandelier. 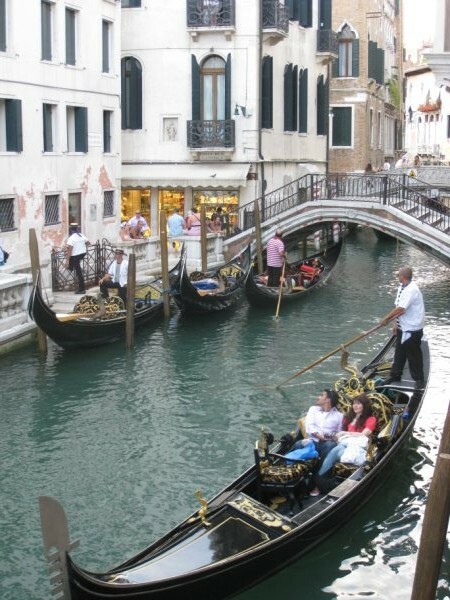 It may not be a romantic gondola ride for two but on the upside, times have changed and as an unmarried female I have other options besides joining a convent. Is Venice romantic? Yes. But. Venice may seem like the perfect place to celebrate wedded bliss, but dig into its history and you’ll find plenty of unwedded bliss, too. Transat Holidays offers flights, hotels and packages for Venice. Visit www.transatholidays.com. For more information on Italy visit www.Italiantourism.com. Update on the Venice romantic front: It’s seems ironic but I did end up in Venice on my honeymoon. Life never ceases to amaze. What kind of info do you need, Diane? You do know I’m not a travel agent, right? More info needed as we are heading out to Venice in mid August. Hey Carol, It’s great to read this just before heading off to Venice next week!